The Short and the Sweet of It: Week - End. This week was a whirlwind. I returned yesterday from Los Angeles after a very productive days at the Lulu & Georgia office. I am beyond excited to share with you some of the recent projects we've been working on, it's part of the reason that I've been a little MIA lately (my apologies). Tomorrow is my baby shower (or sprinkle as it's often called for your second) and on Sunday Matt, Mila, Gorbie and I might venture up to Cardiff for some beach time and we'll probably stop here for a taco. What are your plans, I'd love to hear! This video of Swiss mountain climber Ueli Steck is mind-blowing. 30 Things Only Drivers in Los Angeles Will Understand. I have more appreciation for this now. Mary Jo Matsumoto just launched her new website. I'm obsessed. Look at this wallet! Madewell is killing me with their new arrivals. I really love this dress. This memoir about twins looks really good. Brynn's bohemian summer soiree makes me want to run to the fabric store immediately. Design Darling has some adorable goodies on sale! And I completely love this bathroom remodel by Emily A. Clark! do love that madewell dress! Can't wait to see what all you have in store! And totally agree with the Madewell new arrivals, I want it all! Great links, madewell is killing me too! Happy weekend! Have a fabulous baby shower! All of the Madewell dresses need to be mineeeeee. Sounds like a wonderful weekend, and I can't wait to hear more about what you've been working on! i've never heard the term baby sprinkle, cute! i love mary jo and her new site is beautiful. and, oh, that book looks good but having twins, i don't know if i could handle it. i got teary-eyed just reading about it! A sprinkle??!! I love it. I had never heard of the second baby shower called this....but what a perfect name. I hope it's wonderful. I love everything Brynn does. She is sweet and so talented. Can't wait to hear about the exciting projects! love that photo...I am looking for a few succulents to adorn our living room. They are the cutest little plants. oooh, you must be so excited about your baby shower! I hosted one for my sister in law last year, it was lots of fun and so special, to be there with friends old and new, all to celebrate the mom. It's lovely. Ueli Steck just freaks me out, I am always lost between terror and immense admiration when I see videos of him! 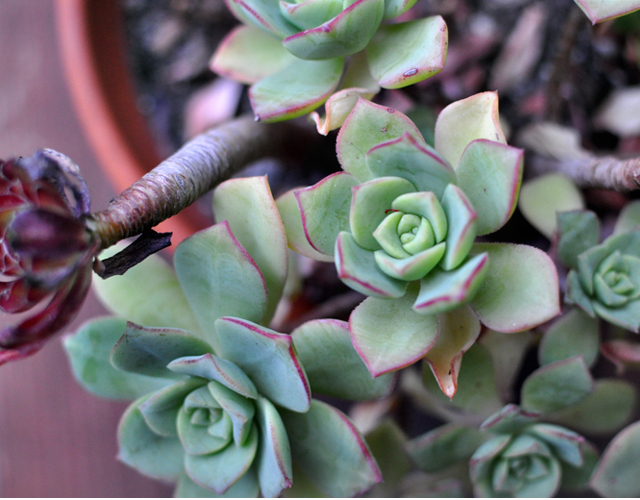 Lovely succulents - I need to get some for my kitchen window! Off to stalk these links now! Oh, the drivers in LA thing is amazing. I mmhmm-ed and YES!! !-ed my way through it.